There were some fears that the second coming of “Carmageddon”, a full closure of the 405 between the I-10 and the I-101, might really bring the disastrous traffic jams that were imagined but never materialized the last time around. By all accounts, traffic was no worse this weekend in Santa Monica and the Westside than any typical sunning idyllic weekend. Sam Morrissey, City Traffic Engineer for the city of Santa Monica reported “Santa Monica calmer than a usual sunny Saturday. No real traffic impacts.” If UCLA’s research last time was any indication, the air was dramatically cleaner. At the same time that contractors were furiously destroying perfectly good infrastructure, people all over Los Angeles were celebrating the absence of cars on the 405, bicyclists especially. The LACBC organized Westside rides appeared to be a hit. I saw one of those groups go by with at least 100-200 riders. C.I.C.L.E. also hosted an event for those on the other side of the hill, ensuring our friends in the Valley weren’t left out of the fun. I took part in the Midnight Ridazz “Carmaheaven” ride, the final details of which came together at the last minute. The event involved many of the same people that put together the Flight Vs. Bike event last year, myself included, and led by Don “Roadblock” Ward. Don & Joe Anthony (who was a Jet Blue racer in Flight Vs Bike) of Bike Commute News made brief television appearances on NBC expressing their thoughts on the ride and opportunities a freeway closure represents. Though modest in pace, the Carmaheaven ride was several hundred strong, and fairly epic in scope. The ride started at the new Grand Park in Downtown Los Angeles, after feeder rides and transit riders came from as far away as Pomona. The ride included a viewing of the 405 at the Sunset bridge (pictured above), and concluding with a nighttime bonfire at Dockweiler Beach under a full Harvest Moon. The fact that a major automobile artery is shut down feels like a holiday, one that locals bars even name mixed drinks after, does say something about a shift occurring in the culture. No roaring thunder of sound, no particulate pollution. The 405, quiet and peaceful, during it's brief window of hibernation. Fun times aside however, perhaps no other project in California is burning through so much money for so little theoretical benefit. We are destroying and rebuilding multiple bridges and ramps primarily to accommodate the construction of one additional lane (on the Northbound side) for a 10 mile stretch of the 405, at a cost of just over a billion dollars. A billion dollars invested in bike lanes, cycle tracks and off street paths could have been absolutely game changing and transformative to the quality of life across the entirety of the Los Angeles region. In short order, Greater Los Angeles could have become a world-class cycling destination if we prioritized accordingly. Instead, Metro and Caltrans might save a fraction of peak hour 405 commuters a few minutes off their car commute. If we’re talking about a net benefit that accounts for the delay and hassle created for those same commuters during the extended destruction and construction processes of this entire project, than I’m really skeptical. If we allocated just a fraction of our highway mega project spending differently, quality bike facilities like this Long Beach cycle track could be common place in the LA region rather than disjointed rarities. There are several takeaways from the Carmageddon saga and 405 “enhancements” process that should prompt some reevaluating of what we’re doing with our civilization. One take away is that the already largely disproved notion that traffic is like water, simply shifting to another route if one is blocked, does not reflect reality, particularly when capacity constraints are known advance such as during these widely publicized full closures. We’ve seen this clearly demonstrated twice in a row. Given the complexity of our human response to traffic, induced demand, social factors, economic constraints, and the power media awareness appears to have, our highway engineering profession blunders forward, cash in hand, with far too much confidence. Their flawed project models don’t really know what the benefits, liabilities or consequences of their enormously scaled and costly projects will truly be over the long term. Charles Marohn has continued to refine his case for dramatically rethinking our approach to infrastructure planning at Strong Towns, one that is more organic, and less reliant on assumed future projections. The whole series of his recent posts on this subject is worth a read. This weekend life went on, people still had a great time, many with cars, many without. Some tried bicycling or our Metro system for the first time, or learned new routes they had never been aware of before. Several of the people I led to the Carmaheaven ride from the Westside, on a route incorporating the Ballona Creek bike path and the Expo Line, had never ridden the rail system in LA before, or knew that the creek path offered a car free route to Culver City from Marina Del Rey. If there is one good long-term improvement that could come of this, it would be if this were the tipping point that finally snapped us out of our “highway building at any cost” trance. If the eventual completion of this project finally demonstrates beyond a shadow of a doubt how futile it is for Caltrans to continue chasing the mirage of happy motoring through never ending expansion, such an outcome could end up being the most valuable return on the investment. If we want a transportation system for both people and goods that is world class and relevant to the hard realities of the 21st Century, we should be managing our freeway network smarter, not bigger, and doubling down instead on making our communities more walkable and bikeable, with better bus service, and accelerated construction of our burgeoning rail network. Measure R would not have gotten the needed 2/3 votes for approval if major road improvement projects were not included. This is the source for funding not only road and transit projects, but also most of the bike lanes being installed in L.A. Likewise, Measure J has little chance of passing if major upgrades to roads is not emphasized when selling this ballot measure to the voting public. That’s because 3/4 of the voters are drivers. When overpasses and buildings are torn down and hill sides are dug into for installing bike paths, then we’ll know that bicycling is thought of in equal terms with transit or driving. That probably won’t happen until we approach the cycling rates that the Netherlands has. So, until then, it looks like there will be a series of baby steps to get there, which will likely take decades. Chicago has the most aggressive schedule for installing cycletracks of any large U.S. city, and if they succeed in attracting significantly more riders, then this could spur interest in more public money going towards cycling. I agree with Dennis below that Measure R probably had to include highway projects in order to build enough support. And now that the 405 has continuous HOV lanes the whole way, hopefully the HOT lanes on the 110 and the 10 will build support for the HOV lanes on the 405 to become HOT lanes, which would provide some revenue to build a light rail or heavy rail line roughly paralleling the 405. Anyone have good data on per-foot costs for building cycle tracks? It would be interesting to know how much you could build for $1b. 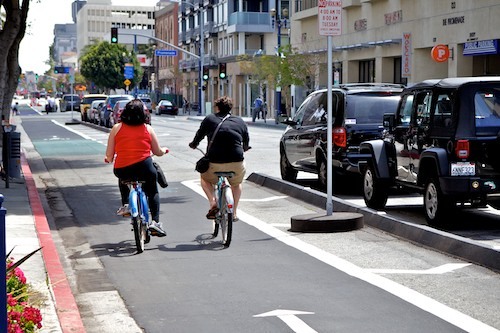 If we’re talking just striping bike lanes you, could probably do thousands of miles for $1b. I used to be a highway engineer (now I do rail) and I have to say, I think we take a little too much blame. We gave people the road systems they asked for. If you want to throw the book at anyone, it should be the planners and architects. The planners were the ones who decided that every land use had to separated and that huge swaths of land would be zoned for low-density residential. The architects were the ones who decided cities would be soulless Le Corbusier towers. At worst highway engineers were complicit enablers. I’m also finding myself compelled to throw cold water on the Strong Towns argument about infrastructure planning. Yes, highways have been built to support land speculation booms, but the same can be said about railroads. When the NYC subway was built, parts of the Bronx and Queens were still pretty rural. The subway was built with the understanding that building the subway would change that. The same can be said about the streetcar suburbs in Boston – it was the construction of the streetcar line that allowed these new districts to spring up, not the other way around. And probably the biggest infrastructure/land speculation insanity of all time was the Transcontinental railroads, which traversed about 1,500 miles of nothing between the Mississippi River and California. They were built with the understanding that a land boom would draw settlers (farmers, ranchers, and miners) to those empty quarters. Sometimes it worked; sometimes it didn’t. Was it really any different to have a bunch of homesteaders in North Dakota go bust in the 1880s than to have a bunch of foreclosures in the IE in 2008? On the other hand, Los Angeles exists today because of one of those RRs. Anyway, I’m realizing this is a rambling, wildly off topic comment. I guess to sum it up… I’m all in favor of building a lot more bike/ped improvements, very quickly. But we shouldn’t always trash freeways the way planners in the 50s and 60s trashed rail. My view in my columns are my own, but I believe we should be trashing urban freeways or at the very lost not building anymore or expanding them. I think we should stop all highway expansion and take a time out to consider what the hell we are doing. The externalized costs they impose onto society is far more dramatic than rail, and from all the data I am looking at, are dramatically less sustainable in the long term given rates of fossil fuel resource depletion and the emissions they produce in ecological terms, but also in financial terms as Strong Towns has been making its case. I don’t solely blame the engineers. As you said, in many ways they were enablers of our society’s poor judgement, but I also believe professions should have at least some adherence to a code of ethics. Clearly the prior generations of engineers did not, as well some still practicing today, as evidenced by the death, property destruction and neighborhood demolishing that have became such normalized components of our transportation system. Often times to accomplish projects that never fix the problem they suggested they would in order to fund their projects. Other professions (and clearly the political elite) are at fault in this whole mess as well but I focused more on highway engineering here, because that is what this project is. I call out bad land use planning and other faults regularly in my column as well. As for road speculation of eras past and the highway and suburbia driven busts of today, yes it is different. The scale of everything, and the consequences are all much larger now. Entire giant swaths of landscape as far as the eye can see have been plowed over and cookie cutter factory houses plopped down row after row, in some cases wiping out numerous acres of what had been productive agricultural land around the urban edge, leaves a different mark in a bust than the typically compact little rail road towns that flopped. This not to say speculative rail road building is justifiable, but the scale and the consequences of what we have done in recent decades appear to me to be orders of magnitude higher, and I find the comparison dubious. I realize Measure R included highway projects to pass through, and I voted for it as well, but that doesn’t mean the political climate couldn’t change enough to justify reallocating funds away from highways if enough support to focus on other forms of transportation materialized, or enough resistance to highway expansion. Every dollar spent on the exercise in futility that is expanding an already giant urban freeway network just a little bit more, but at great cost, represents a dollar that could have been spent doing something productive or enhancing to quality of life. Los Angeles is decades behind in sidewalk repair for example. My understanding is a billion dollars would just about cover enhancement of sidewalks up to code city wide. That could have benefited literally everyone, even drivers use legs sometimes. This 405 project will really only benefit a fraction of 405 commuters for a fraction of the day. To me that is neither fair, nor democratic. @GaryKavanagh:disqus Having worked in both highway and rail, I can tell you honestly, like any profession there are a mix of people. Most highway engineers do consider themselves to be ethical people and if you ask them what the most important thing about a design is, they will tell you public safety. Of course, in the 60s and 70s safety didn’t include any consideration for biking or walking, but that is changing. When I worked in highway, I frequently argued for better bike/ped design even if it meant slower speed or lower capacity for cars. I agree that our transpo priorities are flawed. The wisdom of widening urban freeways should be questioned. Rural freeways are even worse. The 405 at least serves hundreds of thousands of people, and could include HOT lanes or bus lanes. In the future, you could take lanes from cars for a ready-made, completely grade-separated BRT or heavy rail. Compare that to say, the 99 freeway in PA, or any number of rural freeways that continue to spring up all across the country. Maybe $1b on the 405 between the valley and the Westside is worth it, maybe not. But $630m to connect Bald Eagle and Bellefonte was almost certainly a waste of money and a needless destruction of wilderness. Engineers love a challenge; we’d much rather build a subway under Wilshire than build a freeway in the middle of nowhere. If the political culture and people’s demands change, we’ll follow. The 405 Sepulveda Pass Widening: Is This Really Worth It?